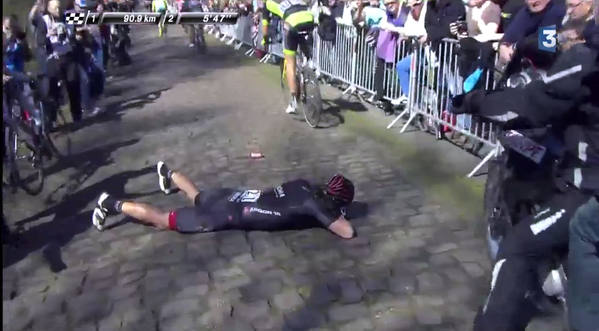 Second to last and over 34 minutes behind the winner John Degenkolb, Shane Archbold battled through to the finish of the 2015 Paris-Roubaix despite crashing head first in the Arenberg Forest. The Kiwi on Bora-Argon 18 suffered a front wheel puncture in the most notorious and difficult of the 27 cobbled sectors in the Hell of the North, causing him to lose control and land on his face and wrist on the moist stones. Where many riders would have thrown in the towel, the 25 year-old nicknamed ‘The Flying Mullet’ battled on for 95km to the Roubaix velodrome with crusts of blood smeared down his face and across his wrists. “I punctured my front wheel at 60km an hour and went face first into the ground, that was about it,” Archbold explained by the infield of the track. Archbold rode onto the track with fellow New Zealander Sam Bewley (Orica-GreenEdge) but confessed to being unable to fully enjoy the experience of finishing his first ever senior Paris-Roubaix. “It was just a long day. Having a fellow New Zealander with me made it more enjoyable,” he added.